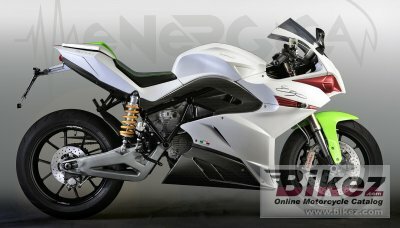 2014 eCRP Energica Ego 45. Picture credits - eCRP. Submit more pictures. The Ego 45 is a revolution in the concept of luxury: a unique version of the Italian electric superbike celebrating the 45th anniversary of its manufacturer, CRP Group. The limited edition has carbon fibre fairings and a special shape featuring elements made with 3D printing technology and Windform� materials, specially covered with a ceramic finish by English company Zircotec. Comments: Italian brand. Small windshield. 11.7 kWh battery. Range 150-190 km. A Vehicle Control Unit implementing a multi-map adaptive energy and power management algorithm manages the vehicle. During drive, system carefully monitors and adjusts 100 times per second the motor�s power, starting from; throttle command; chosen engine map; battery status and speed. System also handles regenerative engine braking, interfacing with the ABS unit. Ask questions Join the 14 eCRP Energica Ego 45 discussion group or the general eCRP discussion group.